A comprehensive 16 page checklist for questioning the plaintiff or a fact witness in a product defect case of personal injury or property damage. For plaintiff or defense counsel at deposition or at trial, or for witness preparation. For the plaintiff's attorney, the form shows the areas and questions for which the plaintiff must be prepared. For the defense lawyer, the checklist is a comprehensive 16 page list of items to consider asking the plaintiff. Our Products Deposition Checklist will be used in all your product personal injury cases. For all products cases, over the years, this question outline will save you hours of deposition and trial prep time. — a real value! Too many attorneys have the sinking feeling when they walk out of the deposition of the plaintiff or finish the preparation of their client for his/her deposition, they had missed a critical area! Until now you had to take hours to devise a long checklist before the plaintiff's deposition in a products case. But that no longer has to be you. Now I can hand you a 16 page checklist that will relieve you of a large chunk of preparation time. Plus give you an organized plan of attack, with the right flow to get the result you want from the deponent. Guaranteed! If you use our form instead of starting to draft one from scratch yourself, I guarantee you will save 30% or 40% or maybe 55% of your preparation time for a products defect case. This is a real time saver, that also will guide you to a better job than if tried to do it alone. Everything’s guaranteed. No questions. No red tape. The best guarantee in the law form business. If you do not agree this is worth every penny, just ask for your money back in 60 days. You keep our product. You get your money back! You cannot get a better guarantee. You have nothing to lose! Let’s talk more about why it benefits you to use a battle-tested checklist in a products design / manufacture / assembly/ warnings case, and about our Products Deposition Checklist – Plaintiff or Fact Witness question outline in particular. Products liability cases are the most burdensome of the major categories of personal injury cases. They take lots of time, and they take lots of money laid out for expenses. On the plaintiff’s side, you feel the defense starts with all the advantages of money and experience. On the defendant’s side, you feel the pressure to perform with excellence for the manufacturer or insurer that hired you to defend. You know whether you get the next case depends entirely on how you do on this case. On both sides of the counsel table, you need all the time-saving, money- saving help you can get, to know the fact areas to cover, and then to think about each of the sub-areas within each general area. shaves hours off the time you would otherwise take to develop a question checklist of this length. This form is 16 pages long. is easy and inexpensive to buy. is what you as a defense lawyer need to make it easy to develop the questions to ask a plaintiff in a deposition. is what you as a plaintiff's personal injury attorney need to prepare your client for deposition or trial. is what both a plaintiff's attorney and also a defendant attorney need to depose any accident fact witness in a products case efficiently, clearly, and comprehensively. will be used time after time, in case after case. is an easy to use tool. is your mentor in a box. is the difference between being at a deposition with a feeling of confidence versus just being there. is a very low investment with a high value return. The cost to you for this comprehensive 16 page checklist is only about $1.68 a page. You cannot even dictate and have your own words typed for that price. Here is more great news — Products Deposition Checklist – Plaintiff or Fact Witness furnished to you, in PDF format, right to your computer, by immediate download access. If you are doing the deposition of a plaintiff tomorrow (or if your plaintiff client is coming into your office in an hour), buy Products Deposition Checklist and start getting ready three minutes from now. A good checklist is a lawyer mentor in a box — guiding you and preventing mistakes. Good forms assure that both you and also your witness in a liability lawsuit have thought about the items to be asked at deposition or trial. Good forms assure that you leave a deposition you have taken of an adverse witness knowing that you did not forget to ask questions on the subjects that needed discovery. This peace of mind is the most important reason for preparing for a products liability deposition by starting with a question outline form. The fact is, just the FEELING of that you did what you wanted to do in the deposition must be worth $29.80. Consider your small investment a little “emotional insurance policy” against a dissatisfied client. Products Deposition Checklist – Plaintiff or Fact Witness gives you the questions to ask the plaintiff. But it also works for asking questions of any fact witness to the injury or the facts involving the product defect claim. So for either prosecuting or defending a products case, consider this a form for deposing Any Fact Witness in a products liability deposition. 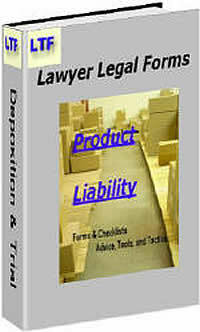 And at the same time Products Deposition Checklist – Plaintiff or Fact Witness gives you as an attorney checklist of items to cover with your own client before he/she gets on the witness stand as either a defendant or a plaintiff and the other attorney starts shooting at them with a full quiver of questions. You will save more than an hour when you use the Products Deposition Question Checklist the next time you have a products case to bring or to defend. — Guaranteed! the usual time saving is 30% or 40% or maybe 55% of your preparation time for a plaintiff’s or a fact witness’s deposition in a products defect case. You don’t have to worry about getting your money’s worth because if you are not delighted , you’re completely protected by my No Questions Asked, Money Back Guarantee! This is your invitation to become a part of the power litigators who take advantage of this time-saving, mistake-preventing, tool. P.S. If Products Deposition Checklist – Plaintiff saves you just one case from collapsing – ever – it will have paid for itself many times over. Attorneys who are using my system right now are saving themselves “should have” thoughts every month.